TORONTO, ON – Today is the release date for Franconian Bock, the latest in the specialty beer release series from Mill Street Brewery. The Franconian Bock (“Frankische Bockbier” in German) is a 7% abv seasonal beer of the type brewed in northern Bavarian state of Franconia. Made with a blend of 3 malts imported from Franconia and German Hersbrucker hops and German lager yeast, it is a malty flavoured, medium-bodied and very drinkable strong lager beer. Medium amber coloured and extremely soft and round on the palate with a smooth finish that is typical of this style, the Franconian Bock will appeal to drinkers who are looking for a more traditional biscuit/caramel palate in this style. We made the Franconian Bock because our brewmaster visits that part of Germany every year and has fallen in love with their Bockbiers. 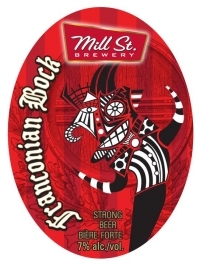 Mill Street Franconian Bock will be going on tap today the the Mill Street Brewpub in Toronto’s Distillery District.